HAROLD Narine who had to seek medical attention at the Georgetown Public Hospital Corporation (GPHC) on Sunday night after he was beaten when bandits attacked his family, returned home yesterday. Narine received 10 stitches for wounds on the head after he was beaten by one of two bandits who forced their way into his Lot 442 Pineapple Street, East Ruimveldt, Georgetown home and business place around 19:00 h.
Recalling the horror of the 10-minute rampage yesterday, he said that the two men, who were both armed with handguns, went up to the gate and requested a case of beer. He said that as he opened the gate, the gunmen forced their way into the yard. The 29-year-old man said that he began fighting with one of them, while the other one held his wife Azeema Narine at gunpoint and forced her into the storeroom. The wife said she was forced to hand over the day's sales of $16,000 from the shop they operate. However, the man was not satisfied and with the gun pointed at her head, he forced her into the house and demanded more. "I keep telling him that I ain't got anymore, but he still kept chucking me", Mrs Narine said. The woman said that she was taken into her bedroom, where she handed over $100,000 and a quantity of jewellery which belonged to her three children. "I was so nervous, I can't even remember opening the drawers", she related. The man then forced her to open the wardrobe, which he ransacked and then fled on foot. The other man who was grappling with her husband also fled. 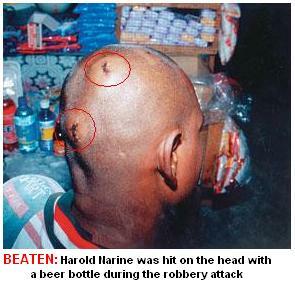 Harold Narine said that as they continued to fight, he hit the man with a pan, and the bandit retaliated by hitting him in the head repeatedly with a beer bottle. His wife tearfully said that she had worked hard to buy jewellery for her children, only to have it all taken away from her in a couple of minutes. "I worked hard to give my children what they had, I don't know if I have the strength to start over." 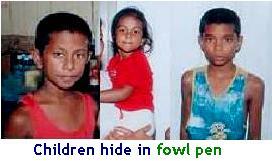 During the ordeal, the three children aged nine, eight and three years old, hid in a chicken pen at the back of the yard. The bandits, wearing caps pulled down in their faces, fled the yard on foot, but according to neighbours they left in a waiting car which was parked around the corner. Narine said some of the money would have been used to pay her bills today. She has been operating the business for the past 10 years and was robbed before in 2001. Thirty-four-year-old Harold Narine had to seek medical attention at the Georgetown Public Hospital after two gun toting bandits beat him and robbed his family of close to a million dollars in cash and jewelry at around 21:00 hours last night. Narine was gun butted in his head when the bandits attacked the East Ruimveldt shop he and his wife, Azeema, operate on Pineapple Street, East Ruimveldt. The bandits managed to escape, although a passing Impact patrol responded immediately to the call for help by residents who witnessed the robbery. Up to late last night Narine was still being treated at the hospital for three gaping wounds he sustained while trying to protect his wife and three children from the attack. According to Azeema Narine, the two gunmen entered her shop and requested to purchase a case of beer. She said that at the time she was attending to two other customers. “I was selling and they come in and called for a case of beer. It came up to $3,600 which they paid in full,” the woman told this newspaper. However, as her husband was about to open the door to deliver the item, one of the bandits snatched him and forced him back into the shop. According to the woman, the men acted suspiciously shortly before they committed the act. She said one of the bandits began beating her husband, while the other held unto her and demanded money and jewelry. “De other one pull me and ask, ‘Whey de money deh?'. I gave them $8,000 that I had sold for the day, but he kept demanding more,” the woman recalled. She said the bandit took her into the house where she handed over some more cash along with the family jewelry. “I don't know if I gon able wuk and mek back all dem things. I thought he would go after I give he de money, but he keep demanding more,” Azeema said. All the while, the bandit who had held up her husband kept beating him. “De one wha holding me husband telling he, ‘hustle you sc..t',” the businesswoman told this newspaper. The woman said her three children who were watching television, hid in a chicken pen, after they realized that their parents were being attacked. 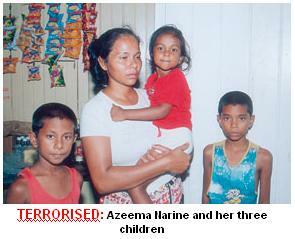 “Look, I had to clean she off,” Azeema said, referring to her baby daughter. When the men were done they fled the scene, but not before discharging two rounds from their firearm. Residents who were nearby heard the gunshots and informed a passing Impact patrol. However, by the time the patrol responded, the bandits had already made good their escape. The businesswoman said that the entire episode lasted for about five minutes. She said this was the second time that the business had been robbed. But according to her, last night's events were the more traumatizing of the two robberies. When this newspaper visited the business, it was closed for the night.